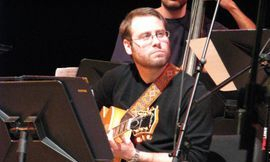 Dr. Andy Nevala currently directs Jazz Ensembles I, III, IV, The Latin Ensemble, and two combos, along with teaching several private jazz students. He was formerly the Coordinator of Jazz Studies at California State University, Stanislaus, where he conducted the Jazz Ensemble, Combos I-V, the Latin Ensemble, the Vocal Jazz Ensemble, and taught courses including Jazz Pedagogy for the Music Educator, Jazz Improvisation, Jazz History, Jazz Piano, Jazz Arranging, and Private Lessons to the upper-division Jazz Studies Majors. Dr. Nevala has been recognized by Downbeat Magazine on 9 different occasions, winning individual Downbeat Music Awards for composition (2002), arranging (2003), and performing/directing (2000, 2000, 2002). He also maintains an active performance schedule in the San Francisco area and across the United States and Europe. He is widely in demand as guest conductor and clinician, conducting the 2010 Campbell Union District Music Festival Jazz Ensemble in San Jose, CA, and serving as a clinician at the Delta College Jazz Festival (2008, 2009, 2010, 2011), the Folsom High School Jazz Festival (2008, 2010), the CMEA Hanford Jazz Festival (2009), the Sacramento State University Jazz Festival (2008, 2009), and the Manteca High School Combo Festival (2010). Having studied under Dr. John Davis, Chip Stephens, Art Lande, and Pat Bianci, Dr. Nevala holds a Doctor of Musical Arts degree in Jazz Piano Pedagogy from the University of Colorado, Boulder, a Master of Music degree in Music Theory and Composition from the University of Northern Colorado, and a Bachelor of Arts degree in Music from Boise State University. His professional affiliations include ASCAP, JEN and AMA. Bassist Chris Enghauser earned a MM in Music Performance from The University Georgia, a BM in Music Performance from George Mason University, is a tenured bassist with the Macon Symphony Orchestra in Macon Georgia and Principal Bass of the Toccoa Symphony in Toccoa, Georgia. Teaching positions include Adjunct Professor of Double Bass at Georgia College and State University, Director of Bands at Monsignor Donovan Catholic High School in Athens, Georgia, Academic Program Specialist in the Jazz Studies Dept at the UGA, and Jazz/Rock Bass Instructor at the UGA Community Music School. 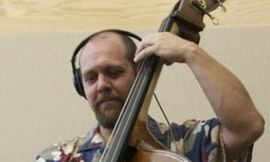 Also at UGA, Chris has served as clinician for the UGA Jazz Festival, Jazz Band Director for the UGA Summer Music Camp, and co-coordinator of the UGA Bass Symposium. Chris' performing experience includes freelancing in a range of styles including jazz, rock, bluegrass, folk, and world music. Highlights include performing on rock legend Chuck Leavell's new CD Back to the Woods, which also features guitar legends John Mayer and Keith Richards. Chris recorded on jazz saxophonist Jeff Coffin's Commonality and jazz guitarist Mimi Fox's DVD Live at the Palladium which also features drummer Akira Tana. Chris performed with national Broadway tours of Pump Boys and Dinettes, A Closer Walk with Patsy Cline, Cole Porter's Anything Goes, and has performed with Bela Fleck, Roy Wooten, Victor Wooten, Sarah Evans, Paul McCandless, Randy Sabien, Randall Bramblett, Barbara Lamb, Mark Feldman, Chester Thompson, Jeff Mosier, David Greir, Mac Davis, Cecil Welch, Kenny Blackmon String Band, Augusta Symphony, Columbus Symphony, Rome Symphony, and Gainesville Symphony. Richmond, Virginia native Ben Weatherford started playing guitar at fourteen and began playing professionally at seventeen. He continued his musical education with honors at Berklee College of Music after high school, performing with future Grammy winners John Mayer, Clay Cook and Nnenna Freelon. Since moving to Georgia in 2003, Ben has been an active member of the Atlanta music and education community. For over 12 years he has taught private lessons, small ensembles, improvisation, composition, and arranging. Ben received a Master's degree in Jazz Studies from Georgia State University in 2011, where he was also a graduate assistant. 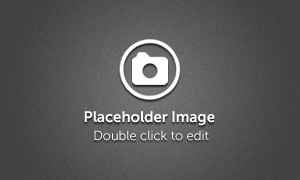 As an arranger/composer, Tony has co-authored (with Tom Wallace) well over 200 marching band arrangements through Arrangers Publishing Company. He also has arrangements/compositions for Steel Band published by Panyard, Coyle Drums and Row-Loff Productions. His arrangement of Ney Rosauro's Concerto for Marimba and Wind Ensemble (Mallet Works Music) has been performed in the U.S. and internationally more than any other marimba concerto in the world. He is an Artist-Clinician for Ludwig/Musser Percussion, Zildjian Cymbals, and Innovative Percussion. He hosted the 1994 Percussive Arts Society International Convention in Atlanta, Georgia and served as the Georgia chapter president of PAS for many years. Tony has degrees from Auburn University (B.S. ), East Carolina University (M.M. ), and the University of North Texas (D.M.A.). He and his wife Susie have four children.